4 Pics 1 Word is a puzzle game that shows you four related photos that lead to a one word answer. A pool of letters are available to choose from to make it a bit easier to solve. 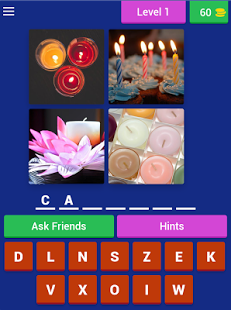 Answer correctly and you will advance to the next level and also earn coins. If you get stuck on solving a puzzle, you can click the Hints button and use some of the coins you have earned to buy a hint to help you out. The options include exposing a letter, removing letters, and solving the puzzle. Or you can save that hard-earned change to ask friends and share the puzzle through messenger to your friends to solve together. There is no account to sign up for, it is just a simple launch and play app. The puzzles have no time limit assigned so you can take as much time as you want to solve them. It creates an ease about the game as you can play when you want for as long as you want with no repercussions. The colors are bright and the layout is very simple. For the most part, the puzzles are fairly easy to solve, but they do become more challenging as you advance. Ads are included at the bottom of the screen but they do not interfere with the gameplay in any way. Share on Facebook to earn more coins to add to your balance for help on future levels. The app is enjoyable to play but also a very relaxing brain teaser. 4 Pics 1 Word is a fun, basic puzzle solving game that is easy-going and a great way to pass the time. The app is available now for free on Google Play. Thank you for the kind review. I’m glad you liked my game. I am adding new levels everyday to keep it interesting and exciting. Is there a limit to the number of coins that can be earned? No there is no limit to the amount of coins that you can earn. When will new games be added? I received a message that I have played all the games! They’re currently 153 levels and I add on average 10+ levels a week. Thanks for the question I will start adding more levels more frequently. I’ve added 7 more levels for you 🙂 I’ll try to add As many levels as I can each day. I hope my game keeps you intertain. Thanks for playing. If you could please leave me a review on Google I would appreciate it. I don’t know how to tell what level I have. My phone says I have completed 3985 games. When I hit play, I get the message that I have completed all levels, and it will not let me access more games. How do I access them? It sounds like you’re playing a different game. Is this the game you are playing? It is called 4 pics 1 word by lotus GmbH. It looks like there are many apps with the same name. I hope you figure out the problem with your other game.